More than twenty (20) participants from Honiara and the outer provinces are attending the course including one travelling across from remote Rennell and Bellona. The course will continue throughout the week and conclude on Friday when the participants will leave qualified to carry out grassroots programs in their schools and communities. The course is being conducted by OFC duo Didier Chambaron, who heads the OFC Education and Training Program and Daniel Shirley, the OFC Player Development Officer, both of whom arrived on Sunday for the course. Participants also had the opportunity to meet with Glen Turner who is the FIFA Development Officer for the Oceania region. SIFF General Secretary, Eddie Ngava, welcomed the instructors and called on the participants to ensure that they make a maximum gain of knowledge from the course. 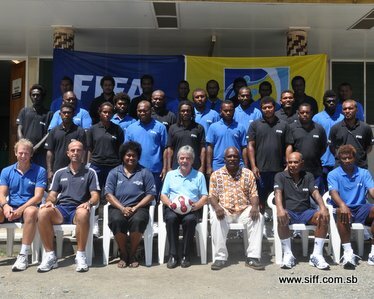 “Thank you to FIFA and OFC for supporting grassroots development in Solomon Islands through the course and to the instructors thank you for coming to Solomon Islands. For the participants, thank you for answering the call to be part of football and I want to urge you all to learn to the best of your ability what these instructors will share with you over the next few days,” Ngava said at the opening. Turner, in his address at the opening reinforced FIFA’s new focus on grassroots development which he said prepares the next generation of footballers. He shared to the participants that the challenge is to transfer their knowledge onto pitches in their communities. “Solomon Islands has the ability and all we need is the commitment at the national level and at the individual to address football development through our young children. The challenge is not in attending this course but it is in how you think about how you will use this training to develop footballers in your homes, schools and communities,” Turner said. The content of the course begins with a presentation on the FIFA grassroots philosophy and this was done by Turner. Today the participants learned about planning and managing football training for young players and the course will go on to cover how to organise football festivals, how to manage a training program and how to conduct practical sessions with children. The FIFA/OFC grassroots course comes under a new coaching structure currently being implemented by the OFC which begins coach education to target the 6-12 year old level of footballers. Upon successful completion of the course the participants will be awarded with an OFC D-Licence certificate. Funding and equipment for the course are made possible by FIFA and OFC.